Fans gather outside Ballpark Village before the season home opener. April 11, 2016; 1:30 p.m.
It’s that time of year again where St. Louis baseball fans gather downtown to celebrate the home opener of their beloved St. Louis Cardinals and the 10-year anniversary of the opening of Busch Stadium. As usual, thousands of fans packed Busch and Ballpark Village across the street in anticipation of a successful 2016 campaign. Brendan Reeb, a merchandise clerk, loves the electrifying atmosphere of opening day. The proud fans of 19 National League pennants and 11 world championships have witnessed a couple World Series winners already in the first 10 years of the ballpark’s existence. Christian Summers, who has followed the Cardinals and lived in St. Louis his entire life, says that Game 6 of the 2011 World Series is his greatest memory of the Cardinals and exemplifies the team. 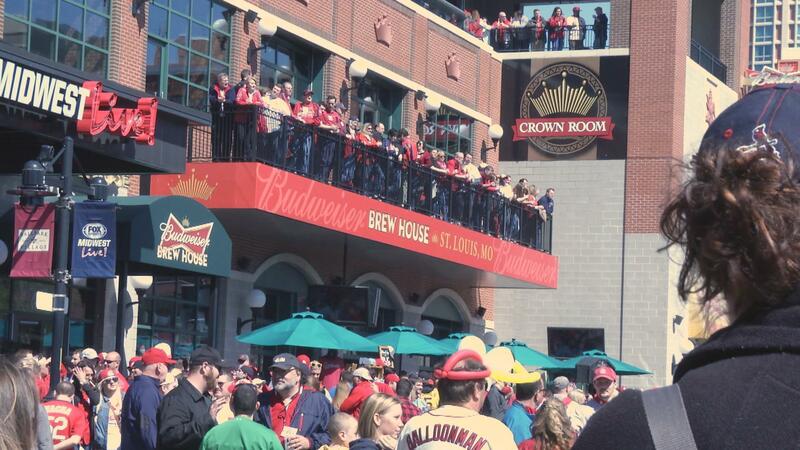 People were gathered outside of Busch and at Ballpark Village up to five hours before the first pitch. The crowd and euphoria on this Monday afternoon seemed like it was a victory parade. Cardinals fans hold up their home-made signs outside Bush Stadium. Diane Wells of St. Charles loves Opening Day so much, that she thinks it should be considered a local holiday.